Ancient rocks of the north-west: Torridonian sandstone in natural ramparts and terraces; quartzite streaming down in screes; drumlins and other evidence of glacation – you’d think the glaciers just finished with the location a few years back......this is scenic drama of the highest order, seen from a single-track road through the glen. For the next picture, you have to make quite an excursion for this Scotland must-see. 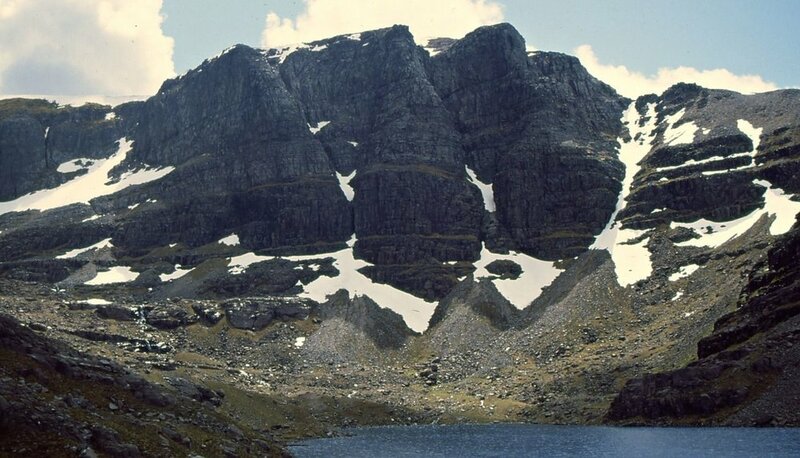 This is the famous triple buttress of Coire Mhic Fhearchair on Beinn Eighe. (Pronounced something like corrie vi-fear-char ('ch' as in loch, naturally, and emphasis in the middle syllable...) Anyway it is the 'corrie of Farquhar's son'. Who was he? No-one knows. But you could see this kind of scenery in Glen Torridon easily on a day-drive from, say, Inverness. But, to emphasise, to get to the point where this pic was taken from, it's quite a serious morning's walk-in. You will need good footwear and so on. Triple buttress of Coire Mhic Fhearchair on Beinn Eighe. As another where to go hiking alternative in the Torridons, get those boots on and wander into the wilderness by the path that leads round the back of Liathach, the grey mountain that squats like an upturned hull along the north side of the glen. This one is for connoisseurs of wild landscape. (Wait a minute, I’ve got to stop waxing lyrical or it’ll be one of these giant pages again....) Read more about this area on my Applecross and Torridon page. From a tour guide’s point of view, this location on the road to (potentially disappointing) Fort William has everything – easy parking for a large vehicle, toilet, gift shop, cafe, audio-visuals and interpretative material, all under one roof out of the rain. Only kidding – though the National Trust for Scotland’s visitor centre here does tick all these boxes. More to the point though, here, on both sides of the road, is some of the most accessible and spectacular scenery of the Central Highlands. And there is the beguiling combination of soaring slopes and bags of atmosphere, plus a real, genuine Highland massacre story. It’s irresistible, even if there were, in the story of clan warfare in the Highlands, bigger massacres. This is where to go in Scotland for great scenery. And if you don't feel like walking then the views are still great from the roadside. A sense of somewhere relatively unspoilt in the northern heartlands – natural pinewood, waterfalls, and the silence of wild places. If you are anywhere near Inverness, this should be on the Scotland list of things to see. The mountain called Quinag in the North-West Highlands. Main road just behind the flowering gorse bush. (...except possibly Achiltibuie, which I almost find a bit dreich and desperate - except the wee mountain Stac Polly - which makes a good day climb). This is classic North-West Highlands, where the distinctly odd-looking, sandstone, fast-eroding peaks sitting on a plinth of Lewissian gneiss are formed from some of the world’s oldest rocks. Another mountain area in the west that makes the Scotland where to go for scenery list. The drive through Glen Shiel is another experience of wild green slopes disappearing upwards into grey rock (and hopefully not grey cloud). The road to Skye page has some more detail on Kintail. Well, they had to be in here, didn’t they? From Blaven to Glen Brittle, there are plenty of spiky horizons. And they say the view across Loch Scavaig to the Cuillins is simply the finest view in Scotland. In this summary of scenic parts of Scotland, I have separated the specific views (see below) from the generally scenic areas. Upper Speyside, some of the Perthshire Glens, upper Deeside, chunks of Galloway, Knoydart, and quite a few more places should also be mentioned. It’s so subjective! Phew! Well, I don't know about you, but I found the top part of this page pretty demanding - all that hiking to get a decent view in wild country. From here on, I promise, it gets easier. You just have to walk a few minutes or, in one or two places, open the car window, for a nice view. I'll even let you wear those shoes, if you insist, while you take the photograph. Some of these suggestions are easy distance from Scotland's capital. So you might want to check out accommodation in Edinburgh as well. (Below) Looking north from the top of The Knock, the wee hill just behind the pleasant town of Crieff. Plenty of heather in this early autumn pic. The Knock lies on the Highland Boundary Fault, so you look north into the Highlands from this point. Crieff has lots of nice places to stay and is a good central touring point for this part of Scotland. Loch Awe, looking into the sun! ...looking the other way from the same place, we find two Scottish tourism professionals scoffing Scottish baked goods bought in Oban for the journey home. (Pictured here) View looking west from the Duncan Ban MacIntyre Monument with Loch Awe leading away to the south-west. Ben Cruachan out of shot on the right. This is one of those views that really need panorama mode - and, even then, the less-than-scenic power lines get in the way. (Pictured here) All right, I agree, it isn't exactly a view, but it is time to remind ourselves that some of these views are also good places for picnics. A snapshot of a little carbohydrate-festival - sitting on the base of the Monument, taking in the view and enjoying some Scottish shortbread I think! Looking south from the B976 to the steep frowning glories of darrrrk Lochnagarrrrrrrrr. (Well, that's how they sing the song.) Foxgloves in flower in the foreground. Ah! The steep frowning glories of dark Lochnagar, as the song says. Specific, I know, but you get a good view of this mountain from the B976. This little road comes out of the north and drops down to ‘Royal’ Deeside at Balmoral Castle - though that’s one tourist hotspot that doesn’t make it on to any list of things to see in Scotland that I compile – quite the opposite, in fact. Lochnagar on the horizon, pictured above. The Eildon Hills behind Melrose were the Romans’ Trimontium and the landmark triple peaks are visible from several parts of the Scottish Borders. It was Sir Walter Scott’s favourite view. And as he was mostly responsible for the romantic tartanified image of Scotland we have to put up with today, his view should be on our lists. Besides, it’s such a change from the Highlands. Again, lots more. There are at least three ‘Queen’s Views’, for example – one over Loch Lomond, another west up Loch Tummel towards the mountain Schiehallion, and also one near Tarland, overlooking the Howe of Cromar in Aberdeenshire.